The release of iPhone XS and iPhone XR drives Apple fans on the cusp of madness, partly due to their 1334-by-750 4.7" display and 1920-by-1080 5.5" screen that are perfect for watching HD DVD movies, TV shows and videos. Except for purchasing movies from the iTunes store ready for iPhone XS consumption, DVD collectors are willing to rip DVDs to iPhone XS/XS Max/XR supported video format using free software like Handbrake 1.0.0 so as not to waste money on the same movie a second time. Sadly, countless posts from users asking for the proper Handbrake iPhone preset, especially when it comes to the new iPhone XS/XS Max/XR, even though the official site indicates that it's a whole lot easier to getting something that amounts to the best Handbrake settings in the latest version 0.9.9. Here we put together the most wanted presets optimized for iPhone, including iPhone XS/XS Max/XR/8/8 Plus and iPad Air. At the very beginning, you need to download the presets. Then run Handbrake, go to "Presets" -> "Options" at the lower right side of the interface and click "Import" to select the preset files you just downloaded and unzipped. Then three iPad and iPhone presets will appear in the presets panel for you to choose. 3. The iFrame preset will allow you to create a file that is almost 960*540, which is half resolution of 1080p and is favored for promoting HD content; It is as close as you'll get full resolution on your iPhone 8 and your iPad. Good option to save space when you watch videos mainly on iPad. 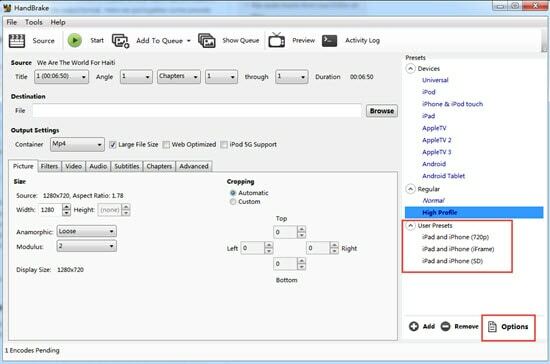 Tips: Using Handbrake to rip DVD to iPad or iPhone only covers iPhone 8 and iPad, limited profiles. For the iPhone XS/XS Max/XR/X/8/7/6s/6/SE/5s or iPad Air, please move to the Part 2. 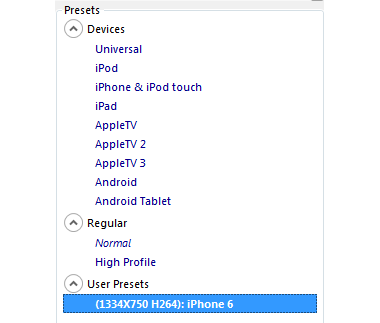 If you've already got the iPhone XS/XS Max/XR/8/8 Plus, then the abovementioned presets are a little out-of-date as it is not prepared for iPhone, and iPod touch 4/5 presets. But the following guide will show you how to rip copy protected DVD to iPhone with Handbrake Mac HD DVD to iPhone presets. Step 1. Hit Win+R after you open folder and paste %appdata%\Handbrake. There are two preset files in the folder, namely handbrake_presets.xml and user_presets.xml, containing iPhone, iPod touch and Apple TV presets. Right click to open user_presets.xml with notepad. Step 2. Replace the original content with the tags below, save and close the notepad. Step 3. Reopen the open source DVD ripper, and you'll see the iPhone XS preset in its Presets Windows. Then you can following our Handbrake rip DVD tutorial to import the source DVD movie, select the destination folder to save the output file, choose the created iPhone XS preset for your output format and commence the DVD conversion with Handbrake 1.0.0. Handbrake is famous for its open-source, cross-platform DVD ripping and video converting performances. But it is still far from perfect, not only because it's time-consuming and complicated for inexperienced users to find the right preset settings, but also because of its other shortcomings as follows you cannot endure. 1. Handbrake commonly faces the problem of inability to scan the right title while ripping Disney DVDs, and other protected DVDs by Warner Bros, Paramount, Sony, etc. 2. It fails to provide you as many as output options, which instead only supports MP4 and MKV formats. To rip DVDs to AVI, MOV, WMV, MP3, AAC, etc, you will need a Handbrake alternative. 3. Many users still expect as many preset profiles as possible, although there are iPhone presets as well as iPad, iPod, Apple TV presets. For people who want to enjoy DVDs on Surface Pro 3, Samsung Galaxy Note, etc, customizing other presets are inadvisable. Finding a DVD ripper with already set profiles is highly demanded. With the abovementioned Handbrake 1.0.0 errors in mind, you will clearly want an alternative to solve all the issues. 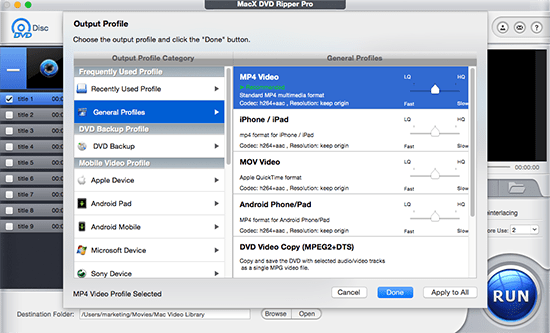 Here MacX DVD Ripper Pro (both Mac and Windows versions) is available for you, not only it provides the Apple iPhone XS presets Handbrake does not have but also it boasts other 390+ preset profiles including iPhone XS/XS Max/XR/X/8/7/6s/6 Plus/5S/5C, iPad Air, Samsung Galaxy, Galaxy, HTC One, PSP, Surface Pro, etc to meet all your DVD converting needs while saving your time in customizing presets for iPhone, iPad and Android. What's more, this best DVD ripper for Mac can copy and rip both homemade and commercial DVDs to MP4, MOV, AVI, MKV, WMV, etc with high quality and fast speed. For your reference: if you wanna play ripped DVD contents on iPhone XS/XS Max/XR/X/8/7/6S/6, you can use MacX MediaTrans to transfer videos from computer to iPhone for playback without any limits. What's more, this iPhone file manager also can aid you to easily export photos from iPhone to Mac, copy music from computer to iPhone iPad iPod, download eBooks from iPhone to computer, etc. Notice: We only advocate using those best Mac DVD rippers to copy and rip DVDs under the concept of Fair Use and do not encourage any illegal reproduction or distribution of copyrighted content. Please abide by the local DVD copyright law before doing it. Dying to convert VOB to MP4 with Handbrake? This article will guide you to use Handbrake to convert VOB files to MP4 on Mac (El Capitan) and Windows (10) for playback on all your Apple Android devices. Best MacX DVD Ripper Pro allows you to freely rip any copy-protected DVDs to various video formats or portable devices with high quality and fast speed. It's a handy thing to have when you're trying to back up your DVD collection.